Monochromatic doesn’t have to be boring! 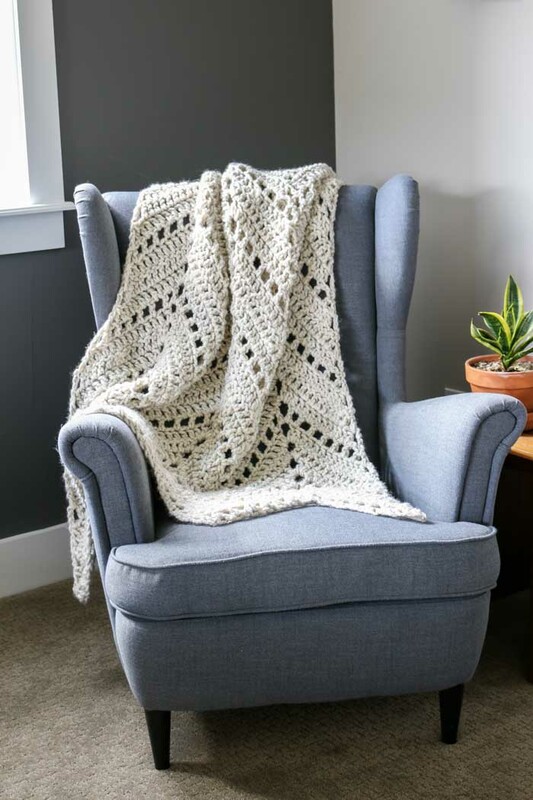 In this modern fringed crochet throw free pattern, two weights of yarn combine to add instant style and texture to any room of your house. The free pattern is below or you may purchase the ad-free, printable PDF with stitch chart for $2.75 here. Anybody else have a little crush on the store Anthropologie? When I used to live in San Francisco, my walk home from work would take me past their downtown store and I would often treat myself to an inspiring lap around the store, filling my mind with decorating and DIY ideas before I headed home. 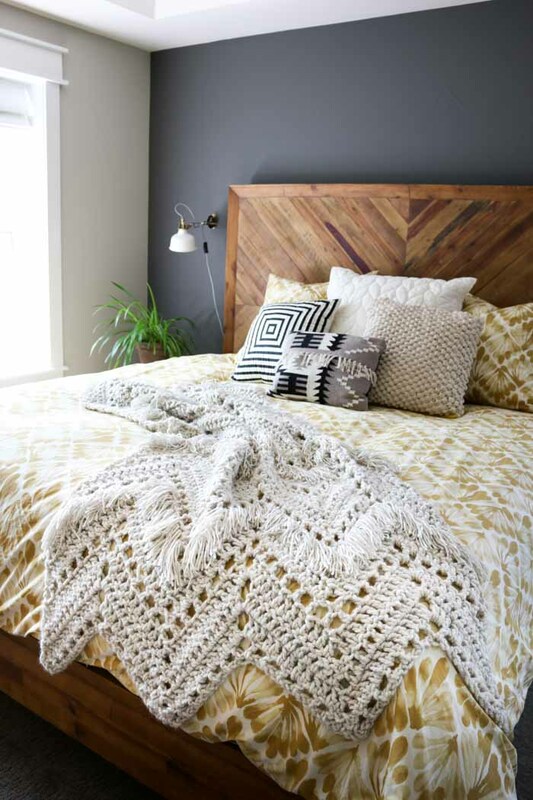 This crochet throw free pattern is part of a partnership with my friends at Lion Brand Yarn. This post contains affiliate links. It’s funny because Anthropologie is so good at picking up on trends that are bubbling up in the maker community and co-oping them for their own purposes, that often I’d find things for sale there very similar to something I’d made in the past. I suppose the channel of inspiration goes both ways. 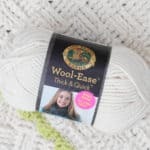 So when I set to work planning this crochet blanket free pattern, I knew immediately that I wanted to use Lion Brand Wool-Ease Thick & Quick for the main afghan. 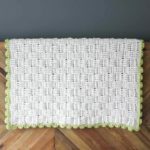 It’s super chunky and squishy, making it work up quickly, and the wool content adds just the right amount of organic texture that I love in home decor projects. If you’re more of a visual learner, I’ve added a bonus stitch chart to the ad-free, printable PDF of this pattern that could be helpful as you learn the basic ripple repeat. Charts are pretty time consuming to make, but man, I find them sooooo helpful that I try to add them to patterns when possible in case you like them too. You can purchase the ad-free, printable PDF with the stitch chart for $2.75 here. 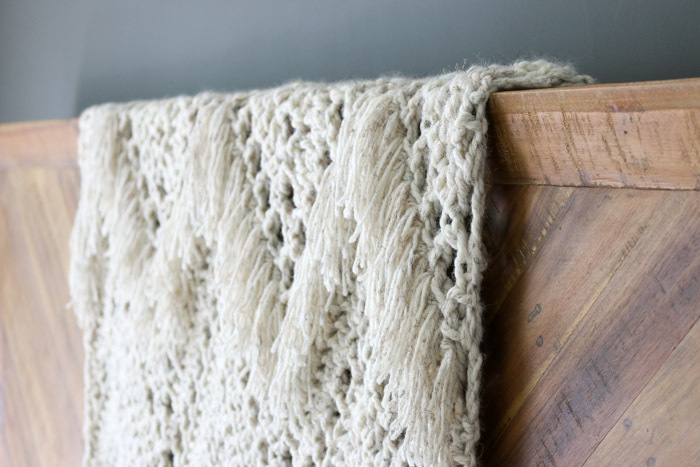 Combine two different weights of the same color Wool-Ease yarn to create a statement throw that’s loaded with texture and style. 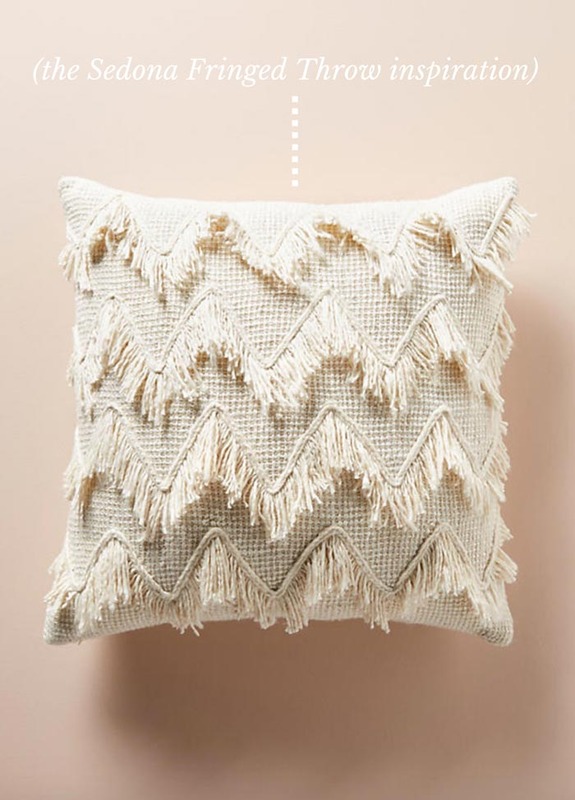 The relatively simple ripple pattern is accented by layers of fringe, just begging to be snuggled with. 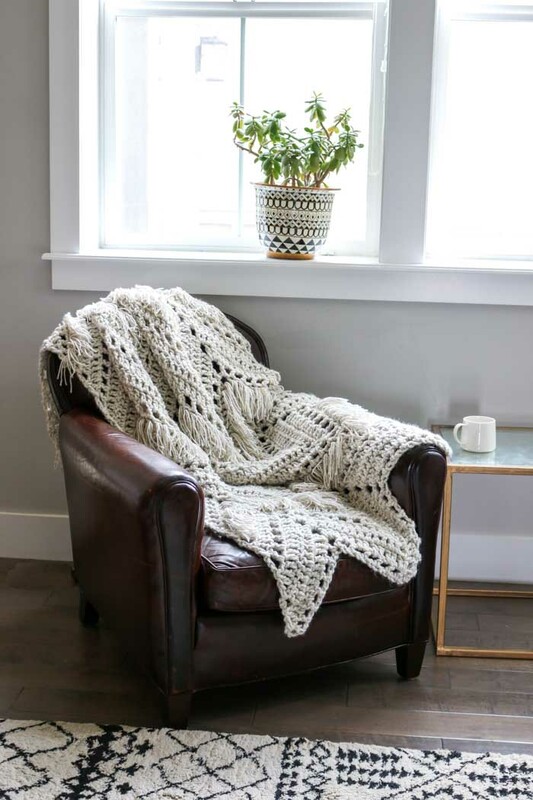 Toss this monochromatic afghan on the back of a chair or over the foot of your bed to instant visual interest to any room. 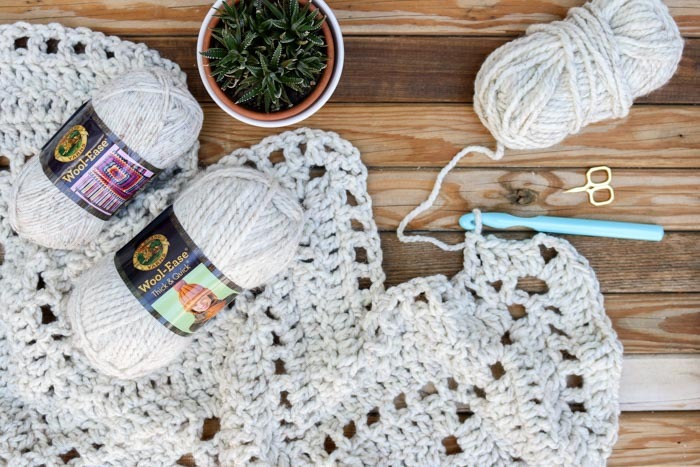 While the skills needed for this pattern are perfect for a confident beginner, there will be nothing elementary about the finished result! • I find that it helps me stay on track if I periodically count the number of dc posts on each slant of the ripple pattern. Doing this can quickly identify if there has been an error increasing or decreasing. If you’d like to count, there should be 13 dc posts on each slant in rows 2, 3 and 4 and 7 dc posts on rows 1 and 5. • To increase the width of the pattern, use a multiple of 27 + 5. • If you prefer learning visually, you might benefit from purchasing the printable pattern, which includes a stitch chart for this section. 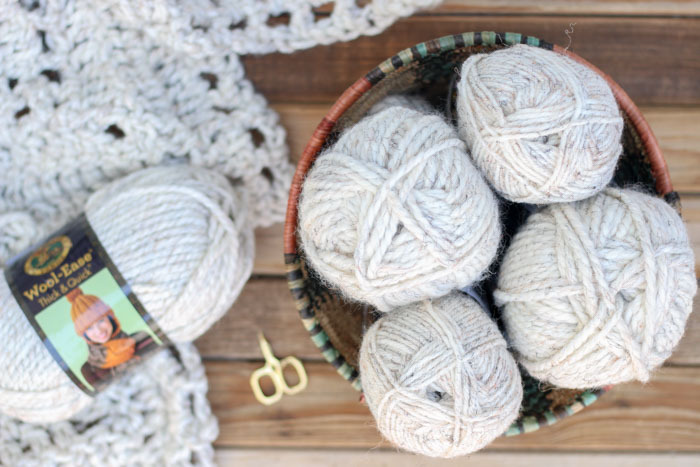 Foundation Round: Using larger hook and thicker yarn, ch 85. Row 2: Ch 3 (counts as dc) , sk next ch1sp, dc in next dc, *(dc in next ch1sp, dc in next dc) 5 times, (2 dc, ch 3, 2 dc) in next ch3sp, (dc in next dc, dc in next ch1sp) 5 times**, work 2dc cluster working first half-closed dc in next dc, sk next 3 sts, work second half-closed dc in next dc, yo, complete cluster; rep from * across, ending last rep at **, work 2dc cluster working half-closed dc in next dc, sk next 2 sts, work second half-closed dc in top of tch, yo, complete cluster; turn. Rows 3-4: Ch 3 (counts as dc) , sk first 2 sts, dc in next dc, *dc in next 10 dc, (2 dc, ch 3, 2 dc) in next ch3sp, dc in next 10 dc**, work 2dc cluster working first half-closed dc in next dc, sk next 3 sts, work second half-closed dc in next dc, yo, complete cluster; rep from * across, ending last rep at **, work 2dc cluster working half-closed dc in next dc, sk next 2 sts, work second half-closed dc in top of tch, yo, complete cluster; turn. Row 5: Ch 3 (counts as dc), sk first 2 sts, dc in next dc, *(ch 1, sk next dc, dc in next dc) 5 times, ch 1, (dc, ch 3, dc) in next ch3sp, ch 1, (dc in next dc, ch 1, sk next dc) 5 times**, work 2dc cluster working first half-closed dc in next dc, sk next 3 sts, work second half-closed dc in next dc, yo, complete cluster; rep from * across, ending last repeat at **, work 2dc cluster working first half closed dc in next dc, sk next 2 sts, work second half-closed dc in top of tch, yo, complete cluster, turn. Repeat Rows 2-5 seven more times. You should have eight sections of ripple. Fasten off and weave in ends. • Reference the video tutorial for a quick visual overview of how to add fringe. 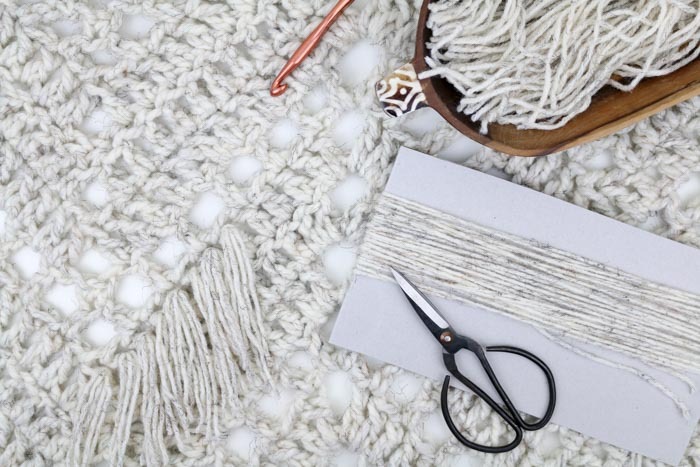 TO CREATE FRINGE: Holding a strand from both balls of worsted-weight yarn, wrap both strands around a 10” piece of cardboard dozens of times. (See photo below.) Insert scissors underneath strands on the upper edge of the cardboard and cut all the strands, being careful to keep them held together and organized. Fold the resulting section of strands in half and cut them again to create pieces of yarn that are approx. 10” each. 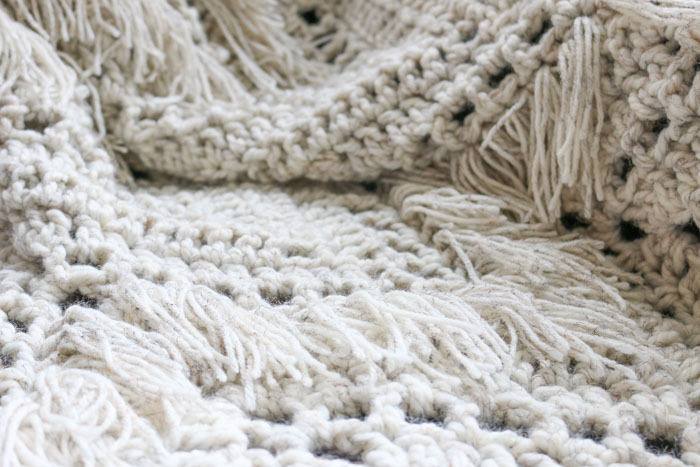 TO ADD FRINGE TO BLANKET: (See photos below for step by step visual tutorial.) Fringe will be added below alternating open “window”-looking rows (rows 5 in the pattern). Counting from the bottom of the blanket where you started crocheting, add fringe in the 2nd, 4th, 6th and 8th section of ripple. 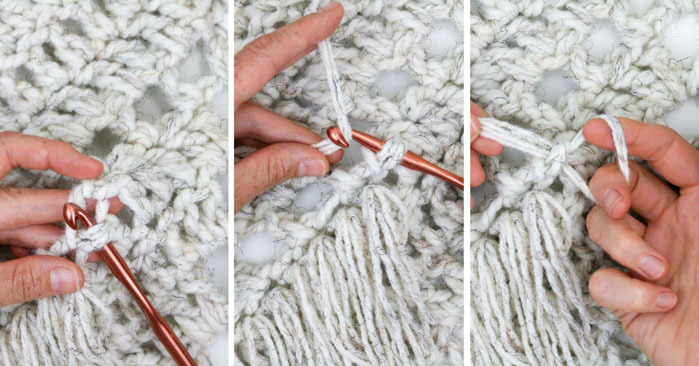 In each fringe row, begin adding fringe in the 3rd double crochet post of the row and end by leaving 2 double crochet posts empty at the end of the row. In the row 4 (below the window-looking row), insert smaller hook into top portion of double crochet post. Use hook to grab three strands of fringe. 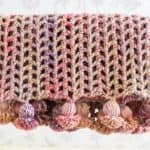 Pull fringe through double crochet post, creating a loop. Pull fringe tails through loop and tug gently to secure. Repeat in the upper post of each double crochet. In the decrease sections of each row (the bottom of the “V” in each ripple), work one total set of fringe into the post of the 2dc cluster. Curl up under your new Sedona throw with a cup of spiced tea and start planning your next desert adventure! 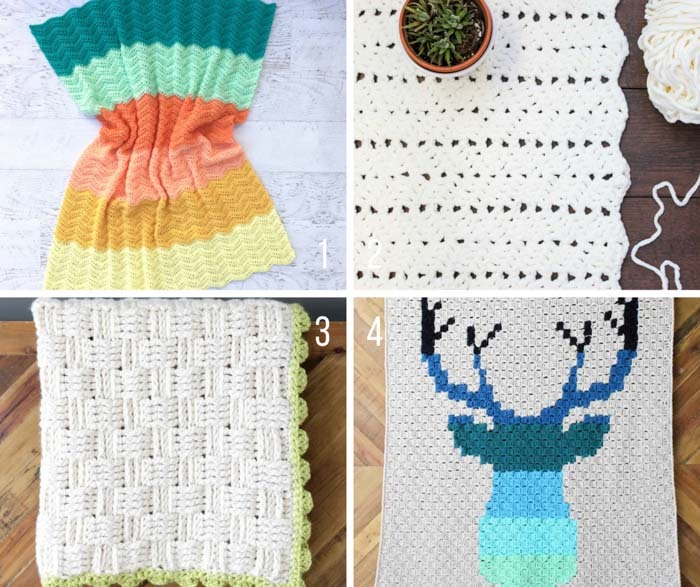 If you love crochet throws, check out these free blanket patterns! Thank you! Thank you! omg! I am in love with this afghan! Is it just me? 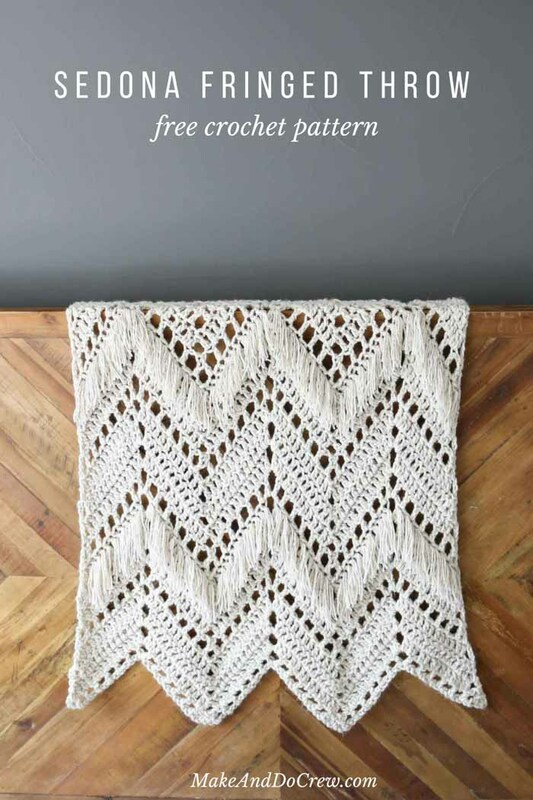 Or does this pattern also scream “SHAWL!”? I mean, think how beautiful a shawl would be with this fringed pattern! Nice hint of Boho takes me right back to the 70s when things were a lot simpler. 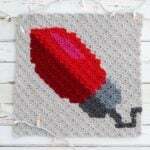 Can’t wait to crochet this. It’s beautiful. omg beautiful not to mention I just finished a fulll length dress with fringe. I love how we had the same thought process. I love the pattern thank you for alwats sharing Im still working on the denim blue shrug. Oh wow! A full length dress with fringe sounds stunning! What an accomplishment! 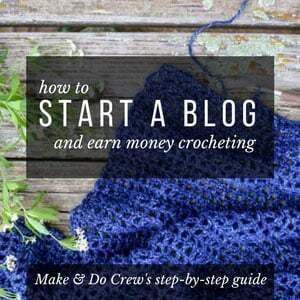 Hello – In row 1, and throughout your pattern, you mention a half-closed double crochet – I have never heard that term before. Can you explain what it is? Hi! This blanket is absolutely beautiful but I’m struggling to align the 2dc clusters. I kept going in hopes of it eventually lining up but it’s completely wonky. What am i doing wrong? Thank you! Hi! I am struggling with the alignment of the 2dc clusters. What do you mean by working the first half-closed dc and the second half-closed dc? I’m guessing this will solve my problem. Thank you! 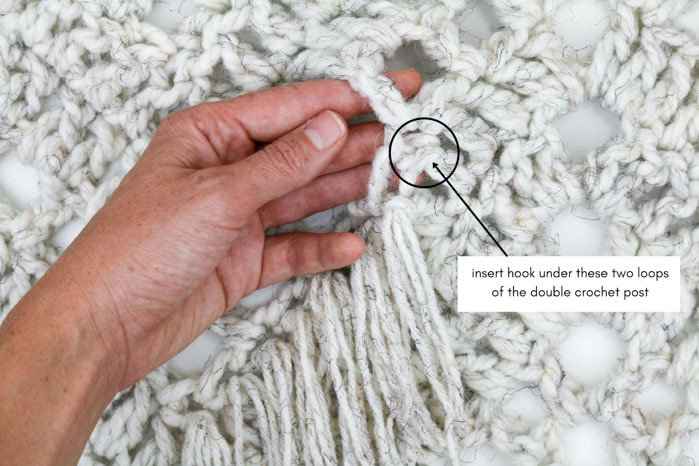 To do this, you’ll work one dc (but don’t complete the final yo), then skip the next 2 ch, then work another partial dc, than yo and pull the yarn through all three loops on your hook. It’s like a dc decrease that’s just spread out over a few chains. Can you indicate where I can find the video tutorial on adding the fringe? I’ve completed the afghan, but would like to view the video. I can’t seem to locate it anywhere. Help, anyone? I’ve begun this and I’ve got about 8 sections complete. I’ve widened it to about double and it is looking so amazing! Thank you so much for sharing this pattern with us. I’ve got a feeling I’ll be using it again and again!